Mid Devon Moorings has its home on the Grand Western Canal Country Park and local nature reserve, which meanders through the picturesque and beautiful Devon countryside. The canal extends for eleven and a quarter miles from the basin in Tiverton through quaint and charming villages up to Lowdwells (near the Somerset border). The canal provides wonderful level walks and bike rides along its miles of nature adorned tow paths. There is a slipway for those that would like to take to the water, or you could experience a ride on-board the much-loved horse-drawn barge that has been taking passengers for trips along the canal since 1974. The origins of the canal come about as part of an ambitious plan to link the Bristol Channel to the English Channel. The Grand Western Canal was proposed as a way to stop shipping sailing around the perilous Cornish peninsular and providing a route for transporting goods, including coal from South Wales into Somerset and Devon. The section from Tiverton to the Limestone quarries at Westleigh (known locally as the Tiverton Canal) was completed in 1814, but due to the use of steep embankments and deep cuttings (to keep the canal level) the cost spiralled; as a result the next section to Taunton was delayed for a good many years, by this time plans of continuing south and linking to the English Channel had been long abandoned. The canal itself is maintained by Devon County Council as part of the local Country Park so it remains very unspoilt and un-comercialised; being a wide canal with no locks and one lift bridge at just under a 2 meter air draft on the lowest bridge; it is a relatively non-strenuous stress free navigation. For more information on the canal please visit The Grand Western Canal website. To see the canal in a down-loadable map Click Here. 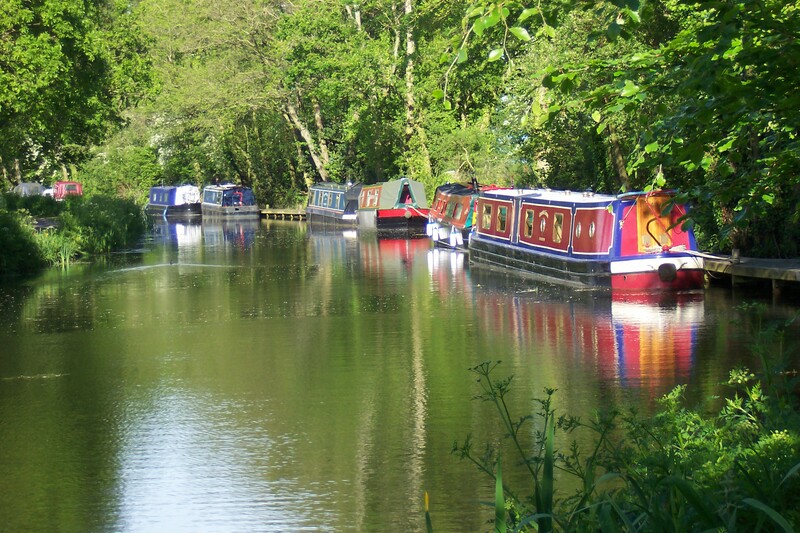 Mid Devon Moorings (formally Mid Devon Hire Boats & Moorings) have a number of beautiful moorings on the Grand Western Canal located near East Manley bridge and have been welcoming craft here since 2004. The moorings are ideally located in a quiet and tranquil part of the canal right next to a winding hole, where each afternoon in the summer months you can watch the Horse-drawn barge turn around for its return journey of 2 miles to Tiverton. You too can chose to take the walk down the canal to the historic town of Tiverton or we are just 10 minutes by car from the M5 motorway connecting you to the rest of the Southwest. We are also able to offer a winter lift out & maintenance service. We can offer short and long terms moorings. We regret that we are unable to offer residential moorings. Cruisers are very welcome on the canal and can be launched with ease up to 25ft (7.5 meters) long from the Boehill slipway. The slipway is in Sampford Peverell and located just a few minutes from the M5 motorway J27.You can use the post code EX16 7EG to guide you in by satellite navigation, then simply follow the signpost up the lane. More information regarding the slipway including maps, directions and canal Terms & Conditions can be found by visiting the Grand Western Canal Website. The canal has a very good craneage area for narrow boats available in the car park at Tiverton Road Bridge (nearest Postcode: EX16 4NG) near the village of Halberton. If you are thinking of bringing your Narrow boat to the Grand Western Canal, but are unsure about haulage and craneage please get in touch as we have a list of good reputable local companies that can be of assistance. In fact if you have any questions we will be happy to answer them for you, simply get in touch using the contact section. The Grand Western Canal is also home to one of Devon's much loved attractions the Horse-drawn Barge. Operating from Easter through until October, the barge makes its way from the Tiverton basin over a leisurely 2 miles before turning in the winding hole right by our moorings and making her way back down the canal to the gentle sound of nature. Did you know that a winding hole is a wide part of a canal that is used to turn boats? As before motor power the wind was used to help with the turn. You can find out more about the Horse-drawn barge including the current timetable by visiting their website. The Grand Western canal is a truly special place, and we can only do it so much justice trough our website. Therefore we have added some links below to other websites that will help you find out more about this wonderful canal and how you can get involved with it or enjoy it to its full potential. The Canal & River Trust. Friends of the Grand Western Canal. Jim Shead Waterway Photographer & Writer. Apollo Duck (Boats for sale). As this lock-free Country Park Canal is also landlocked, boats for sale and mooring facilities are limited, but this pleasantly results in a unique and friendly boat owning community, moored on our peaceful Marina. 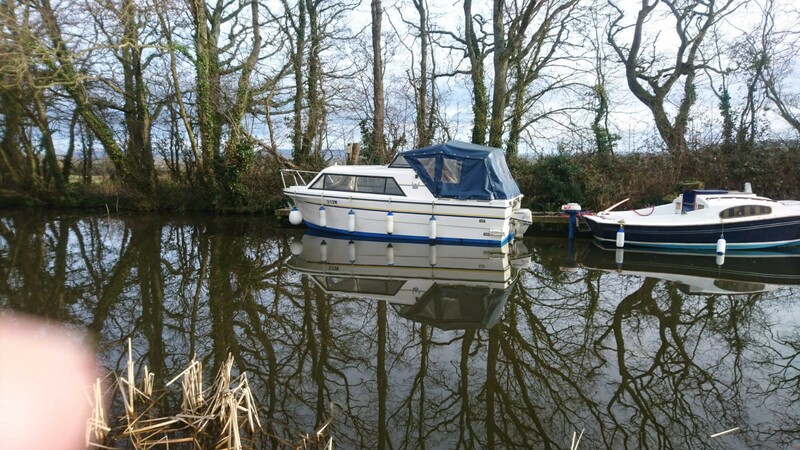 As boats are not sold with a mooring, a prospective purchaser wishing to remain on the Canal, would need to apply under separate negotiation for a mooring. Below are the boats we currently have for sale, please click on the image to open details in a new window. Where no image exists, we unfortunately do not have any boats for sale at this time. The information contained in this web site is for general information purposes only. The information is provided by This Site and while we endeavour to keep the information up to date and correct, we make no representations or warranties of any kind, express or implied, about the completeness, accuracy, reliability, suitability or availability with respect to the web site or the information, products, services, or related graphics contained on the web site for any purpose. Any reliance you place on such information is therefore strictly at your own risk. In no event will we be liable for any loss or damage including without limitation, indirect or consequential loss or damage, or any loss or damage whatsoever arising from loss of data or profits arising out of, or in connection with, the use of this web site. Through this web site you are able to link to other web sites which are not under the control of This Site. We have no control over the nature, content and availability of those sites. The inclusion of any links does not necessarily imply a recommendation or endorse the views expressed within them. Personal Information This website does not capture or store personal information, other than infromation you provide when submitting a form. Tools, such as calculators, do not store the information you enter. We may track the number of users who visit public areas of the website, but this tracking will not identify you. This Site is governed by the Data Protection Act. You have a right under the Act to see the personal records we hold about you. If you want to see your records, please email Pat Brind there may be a small charge for this service - we will, of course, let you know if this is the case. Mid Devon Moorings GDPR statement. GDPR is an acronym for The General Data Protection Regulation (GDPR) (EU) 2016/679 is a regulation in EU law on data protection and privacy for all individuals within the European Union. It addresses the export of personal data outside the EU. The GDPR aims primarily to give control to citizens and residents over their personal data and to simplify the regulatory environment for international business by unifying the regulation within the EU. It was adopted on 27 April 2016. It becomes enforceable on 25 May 2018, after a two-year transition period. The GDPR replaces the 1995 Data Protection Directive. GDPR means that we must tell you what we do with any data you give us and how we intend to use it. How do you find this information? We have a page on our website (this one) explaining how we collect data, what we do with it and how we store/dispose of it after use. In the course of enquiries with MDM you will need to provide a limited amount of data to us so we can process your enquiry for example your email address or phone number, so we can reply to you. In doing that you have provided us with personal or identifiable data and we must protect that data and tell you how we use it. If you make an enquiry via our website we will use the information you provide to us to reply to your enquiry, should you email us, we will use the email address you emailed us from to reply to you, unless you ask us to phone you and provide a number. Once you have done this the data you provide will be used for only the reason stated, you will not be added to any mailing lists as we do not operate any, phone numbers are used to communicate on the issue you enquired about, but for nothing else. Once this has been completed your email and/or phone number will not be used to contact you again. We do however archive emails for auditing purposes and emails and telephone numbers will be archived. Should your initial enquiry become a booking agreement then we may take a payment either via cheque or bank transfer. If a payment is made by cheque the cheque number will be recorded against the agreement for reference, but not any account details. All Bank payments will be direct to our bank (Lloyds Bank), all transactions are secure, and the details of your bank account will be stored there, transaction references will be recorded against the agreement in our office files. Should you choose to provide us with your Bank details, for the purpose of payments due to you within the course of our business dealings, Once final settlements have been made all bank details will be securely disposed of, and/or deleted’. Once your business is completed with MDM your transaction details will be held for an accounting period of 6 years in accordance with UK law. We do not keep bank account details on file only transaction references. This information is not shared with any third parties but may be shared with the proper authorities in the United Kingdom and may include, but are not limited to, the Serious Fraud Office, the Crown Prosecution Service, police forces, the Financial Conduct Authority and HM Revenue & Customs, for the investigation and prosecution of financial crimes. The only information we hold is information that you freely pass to us for the conduct of business between us and you. For the conducting of business between yourselves and us MDM. By providing us with your personal information, you are giving your consent to us to use it, to process the business between yourselves and MDM. Once this is completed, your information will not be used to contact you again.